Do you need to access a remote internet server through a secure tunnel? Perhaps you need to create a website database backup? You might be interested in the highly regarded SSH client called PuTTY, a free terminal emulator for executing instructions in a command line interface. 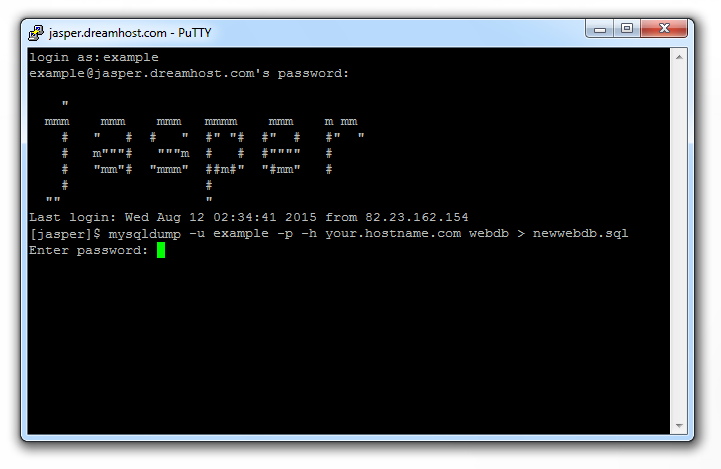 Since Windows has no default SSH (Secure Shell) capabilities for remote servers, you might want to keep PuTTY handy. It acts as a great alternative to WordPress plugins or phpMyAdmin for backing up a WordPress website database via mysqldump. 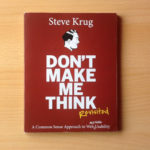 It doesn’t take too long to master the basic commands and it’s great to fall back on this knowledge if your usual workflow routine fails you. I wrote a post about backing up WordPress manually without plugins. I mentioned SSH among other things. Use the following steps to download and set up PuTTY onto your Windows computer. This folder is the location in which you’ll download your PuTTY files. Note: It doesn’t actually matter where you download the files, but adding this directory makes it easier to keep track of the files. Alternatively right click the putty.exe icon and drag your cursor to the desktop. You’ll be prompted to save a shortcut. Before you connect to your server, you’ll need to log into your webhost control panel and make sure SSH is enabled for the user credentials you’ll be using. Basically, you use your FTP username and password – the same details used when you access a remote server to copy website directories. I have been backing up a website hosted by DreamHost, so I used the FTP credentials for that website. You also need to take note of the name of the server you’ll be connecting to because you’ll need that to enter in the Host Name box in PuTTY. You may need to contact your webhost or refer to their knowledge base to find the Host Name and Port settings, such as this GoDaddy page about SSH. 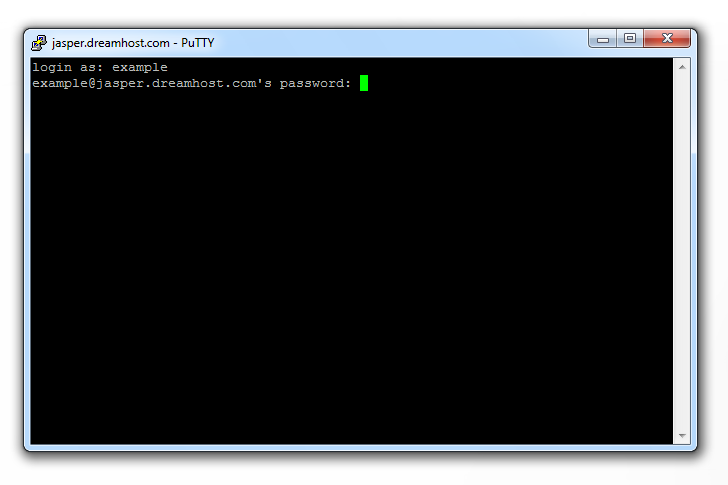 Once the terminal window is open you should enter your FTP username and password. Please note, when typing the password, it will not actually show up. It might look as if nothing is typing at all, when really it is. The characters are not visibly printed as you type them so keep this in mind. If you mistype the password you’ll see an “access denied” message returned. 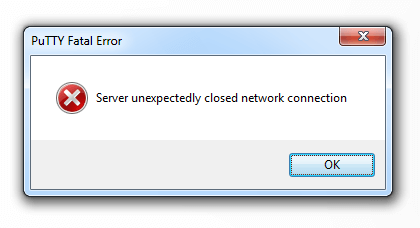 If you get this error it could be because you left too much time between entering your username and password. If you leave more than 10 – 15 seconds the software appears to disconnect. You might also need to ask your webhost to whitelist your IP. When attempting to SSH, an IP that is not whitelisted could be blocked if you keep connecting or disconnecting from the server in a short amount of time. Contact your webhost support and ask them to check to see if your IP is blocked. You can whitelist your IP yourself in most cases. There are instructions on how to do this furthur down the page. If you don’t know your IP, visit whatismyipaddress.com or https://www.expressvpn.com/what-is-my-ip. Now you need your MySQL database name and hostname. You also need the username and password associated with the database. Do not confuse the database username and database password with the FTP username and FTP password. Obviously you enter your credentials in place of the examples. This command instructs the server to create an .SQL backup in the root of your public folder. Please notice there is no space between -p and [password]. This is because any spaces here will mean the password will be interpreted as the name of the database for the mysqldump to act upon.. The reason I want to be prompted for the password on a new line is because it remains invisible as I type it. I don’t like sending plain, visible text through a connection that could result in the password being intercepted. (If I was backing up from a localhost, like WAMP, this would not matter). This means the database is being built and saved. By default, newwebdb.sql is placed in the root directory of the user example. Let me repeat, for emphasis, the .SQL file will be saved to the root directory of the FTP username, NOT the root directory of the website. 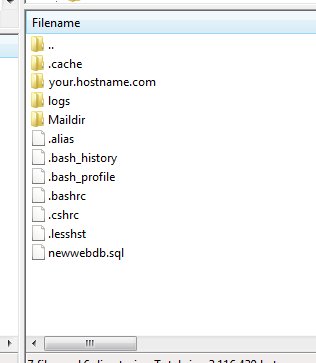 At this point I go and make a cup of tea but the time it takes to build depends on the size of your database. You should FTP into your web server via a client like FileZilla using the username and password you used to access PuTTY at the beginning. Assuming you didn’t disable FTP access for the user while enabling SSH you’ll be able to get in and see the database SQL file. It seems I was getting timeouts which were interrupting the build of my database. I called my host and they told me to try the GZip format instead of SQL. Apparently my database was causing timeouts because it had gotten so big. I tried the following command and I was able to complete my backup without issues. All I had to do was download the file to my machine and unzip it. The dump was compressed down to under 10MB and I only needed winrar to unzip it. The database name you enter is case sensitive because we’re dealing with a Linux server. Don’t make the mistake of entering all lowercase characters if the database uses some uppercase characters too. The trick here would be to type the database with uppercase. For example WebDB. I found this error extremely annoying and wondered if it was because I kept connecting and reconnecting to the server while running various tests. This kind of activity often raises a red flag for a shared host because spammers or hackers are usually a problem for cheaper hosts. I decided to check to see if the IP address of the machine I’m trying to make the dump from is whitelisted for the database user in my webhost MySQL control panel. My DreamHost user settings for the database detected my IP address automatically so I copied and pasted this into the Allowable Hosts field. I have a fixed IP but if yours is dynamic (meaning it changes partially because your machine is part of a private network) you might want to use the wildcard setting. Be warned, using the wildcard setting grants access from anywhere and is considered a security risk. It is generally not recommended unless you’re only doing it temporarily. If you’re IP address changes, you’ll need to update it. I recently did a router DNS flush when I had some general internet connection trouble and doing so reset my IP address. Take a look at http://www.sshcommands.co.uk/ for a list of Shell commands. You can also use git bash which will give you a basic bash prompt inside of Windows, from there you would run “ssh [email protected]” as if you were running a Linux desktop.